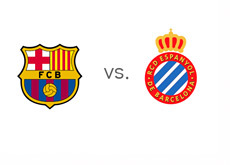 First place Barcelona host eighth place Espanyol in the twelfth round of the Spanish La Liga on November 1st, 2013 at Camp Nou stadium. The kick-off for this Barcelona city derby is at 9pm local time. After drawing 1-1 with AC Milan in the UEFA Champions League at San Siro, Barcelona went on to beat Real Madrid 2-1 at home and Celta Vigo 0-3 away in the domestic league. Cesc Fabregas was in great form vs. Celta, and so was the goalkeeper Victor Valdes. Overall, Barca are playing well and winning games. Espanyol most recently drew 0-0 with Malaga at home, after losing 3-0 to Levante away. On October 19th, Espanyol handed Atletico Madrid their first defeat of the season by beating them at home 1-0. A 100 € bet on Barca could return 10 € in profit, while the same bet on Espanyol could return 2,200 € in profit. The most likely score, according to the odds is a 3-0 victory for the hosts, valued at 6/1. Considering that Barcelona beat Espanyol 4-0 at home in the league last two seasons, it isn't a surprise to see the them as such big favourites. Lionel Messi has the best odds of scoring for the hosts at 1 /5, while Christian Stuani is the favourite to score for the guests at 7/2. The odds of Lionel Messi scoring a hat trick are 4/1. Let's see how this one plays out..